Wow.. you just love to show how ignorant you are, don't you cj? Global warming doesn't mean the earth's tilt has changed. Winter won't go away if the earth warms 5 degrees. It won't even go away if the earth warms 10 degrees. It will just be shorter. It is the height of ignorance to think snow in November in the northern states proves global warming doesn't exist. You are proving something cj, just not what you hoped to prove. You can't - because it doesn't. Prove Obama is a US Citizen. You can't - because he isn't. Any other stupid questions before I ask you to prove you have a brain and say "you can't - because it doesn't exist." You proved nothing. I can post a hundred websites that contradict those global warming conspiricy sites. Also, Dec. 5, Obama has a day in court, before the USSC no less, to discuss his eligibilty. So does McCain. If they both get DQ'd, you're looking at President Pelosi. If they both get DQ'd, you're looking at President Pelosi. As much as I don't like Pelosi, that's still a WHOLE lot better than President Palin. Only if you prefer your women stupid, ugly and mean. I guess another of your fears put to rest cjhsa..
Ive never come across this one. 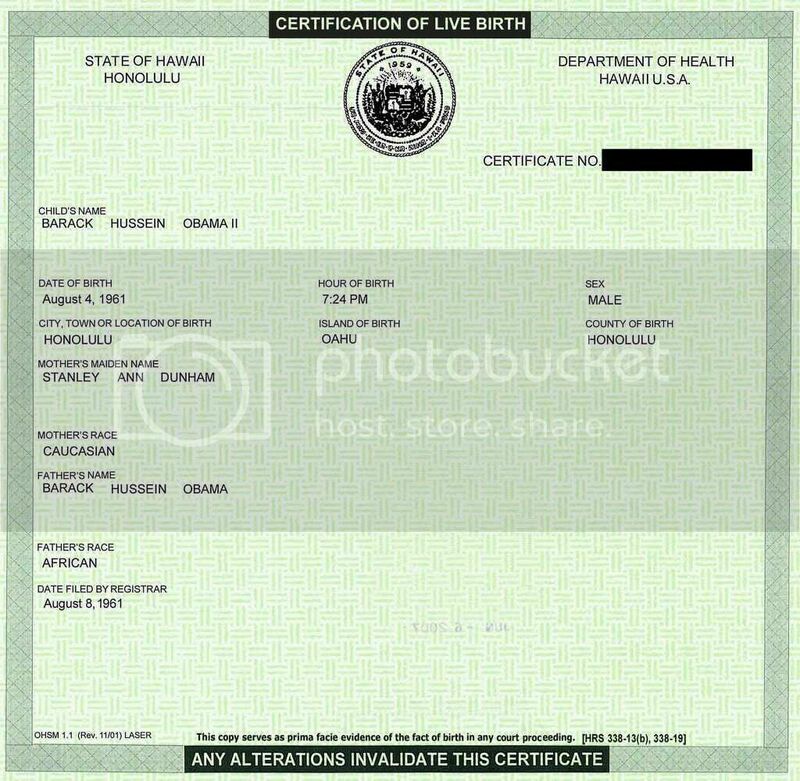 Unfortunately I couldnt magnify a clear image of this birth cert - does it state that Pres Obama was born in the US? It states that Obama was born in Hawaii. I hope you aren't one of those fools that doesn't realize Hawaii is part of the US.